Cumberlands junior Christina Klouda (2:04.20) put up the morning’s fastest time in the 200 back, beating out defending champion and meet record-holder, senior Amanda Moran (2:05.07) of ONU, by 8/10. The two swim this race very differently; Klouda takes it out quickly while Moran is faster over the second half. ONU senior Kara DeLong dropped nearly 7 seconds to make the A final, qualifying third in 2:06.94. 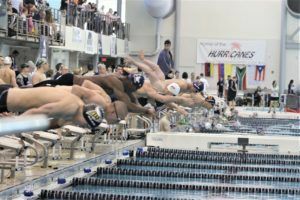 Loyola freshman Kamy Alexander, who placed 4th in the 100 back, qualified next with 2:07.54, just ahead of SCAD junior Shayna Salzman (2:07.70), who dropped 2.6 to make the A final. 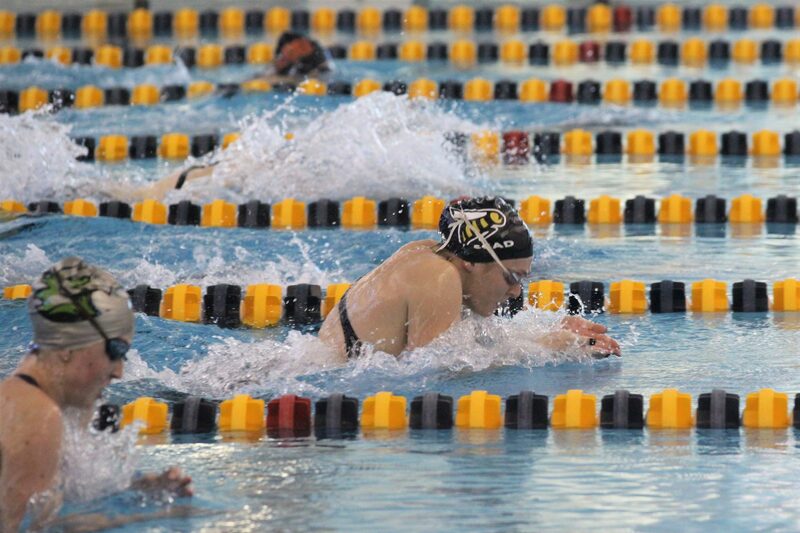 Brenau junior Lindsay Dowling, runner-up to Moran in the 100 back, qualified sixth in 2:08.16. Lindenwood-Belleville freshman Chelsea Merfol (2:09.46) and Thomas’s Kiana Molina (2:09.68) both dropped significant time to make the top-8 cutoff. Lindsey Wilson dominated the morning heats of the 100 free, with the two fastest qualifying times coming from sophomores Alexis Kessler (51.54) and Jessica Macdonald (52.42). Kessler won the 50 free on Day 2 and the 100 fly on Day 3, and is looking for a clean sweep with the 100 free title on Saturday night. SCAD junior Julie Henninger put up the third-fastest time of the morning with 52.49. Also qualifying for the A final were ONU sophomore Leanne Latocha (52.60), Union College senior Olivia Salome (52.70), College of Idaho’s Madison Kelly, who was third in this event last year (52.72), SCAD junior Sarah Dostie (52.80), and Cumberlands freshman Mendy De Rooi (52.95). ONU junior Andrea Vega led the morning qualifiers in the breaststroke, going 2:20.67. Defending champion, SCAD junior Sara Lacusky, was second with 2:21.39. Lacusky is defending champion in this event; she beat Vega last year by 8/10. 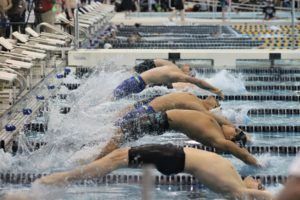 Vega edged Lacusky in this year’s 100 breast final, but Lacusky was victorious in the 200 IM on Thursday night (Vega finished fourth). Julia Hnidenko of Cumberlands, who won the bronze in last night’s 100 breast final, qualified third with 2:22.00. 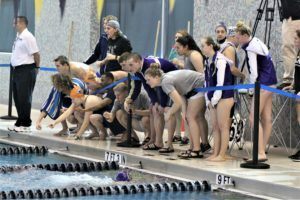 College of Idaho’s Caroline Yannelli and SCAD senior Alle Ragland dropped a couple seconds each to qualify fourth and fifth with 2:22.81 and 2:23.19, respectively. Also making the A final were Cumberlands freshman Cameron Klimczak (2:23.36), Kendra Monnin of WVU-Tech (2:23.88), and Loyola sophomore Paige Carter, who dropped 5.3 seconds to make the cut (2:24.18). 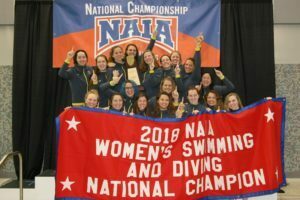 NAIA crowd might be forgiven for being complacent about a 200 fly final full of SCAD Bees (there were five in 2016 and four in 2017). This year, SCAD qualified three for the A final, including defending champion, sophomore Lydia Reinhardt (2:04.88), 2017 runner-up Rebecca Justus (2:06.88), and 2017 fifth-place finisher Cadie Crow (2:08.43). Both Justus and Crow are seniors. The exciting news this year is that the next wave of 200 flyers is the gaggle of freshmen that will make up the rest of the A final: Lindenwood-Belleville’s Marie Geck (2:08.75), Amelie Essman (2:09.08), and Alina Geck (2:10.83), Keiser’s Anna Lofton (2:10.44), and Brenau’s Maggie Davis (2:10.65). Lindsey Wilson College will occupy lane 4 in tonight’s final of the women’s 4×100 free relay, thanks to the prelims performances of senior Laura Stephenson (53.52), junior Bailey Seitz (55.11), and sophomores Macdonald (51.86) and Kessler (51.06), who combined for 3:31.55. ONU’s Vega (52.52), Latocha (52.40), Madeline Miller (54.27), and Deirdre Gerke (53.06) qualified second with 3:32.25, just ahead of Cumberlands’ Katy Smeltzer (53.64), De Rooi (52.40), Houston Burgoon (53.49), and Brittany Liltke (53.32). 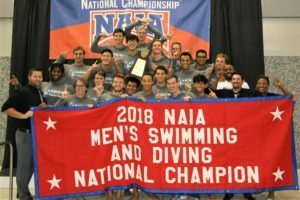 “The National Association of Intercollegiate Athletics (NAIA), headquartered in Kansas City, Mo., is a governing body of small athletics programs that are dedicated to character-driven intercollegiate athletics. « Kyu Hue Paralympian Prasanta Karmakar 3 year Ke liye Ban ?